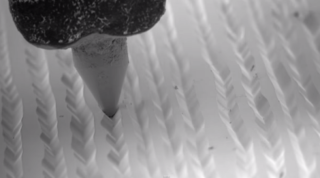 Watch a needle read a vinyl record in microscopic detail | What Hi-Fi? YouTube channel Applied Science has put together an ingenious video using an electron microscope to show exactly that - plus microscopic images of other formats, including CD and DVD. Getting the incredibly detailed vinyl footage was no easy process, requiring a specially adapted record and turntable. First, a small section of the vinyl had to be cut off to fit into the microscope chamber. The record also had to be coated in a conductive material (in this case evaporated silver), as otherwise the electrons fired at its surface by the microscope would have been absorbed, trapped and eventually repelled. A new stylus also had to be made, as the magnets in the original cartridge would have deflected the incoming electrons. To solve this, the magnets were removed. And there's a custom tonearm too that fits into the microscope chamber and acts as a decent substitute to a regular tonearm. The video image the microscope creates has a low resolution, making it hard to see. To overcome this, Ben Krasnow, the man behind the channel, employs a stop-motion animation technique: saving a frame, moving the LP piece by 50 microns, saving another frame, and so on, until he has 60 frames. The frames were assembled using PhotoShop to make an animated GIF, which plays about 1/400th of real speed. The GIF allows you to see that the stereo record has two channels of audio information per groove. And if your mind wasn't blown already, you can then see the same techniques applied to CD, DVD and even a capacitance electronic disc, to deliver some fascinating microscopic images of the information on each disc.